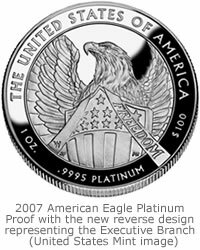 The United States Mint has set the release date and prices for the 2008 series of American Eagle Platinum Proof coins that are the final design in the three-year series entitled, “The Foundations of American Democracy.” This year’s collector proof coins are available on Monday, May 5, 2008 and feature a Judicial Branch design. 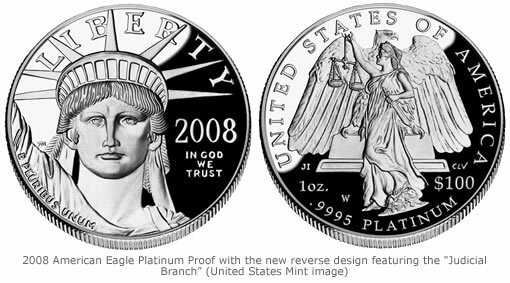 2006 began the new platinum three-year coin series entitled “The Foundation of American Democracy,” which celebrates the branches of government with a new reverse or tails design every year. The “Legislative Muse,” designed by United States Mint Artistic Infusion Program Master Designer Joel Iskowitz, is inspired by, and based upon, the marble statue entitled “The Car of History” by Carlo Franzoni. The figure of Clio, the Muse of History, combined with studio drawings from life, attempts to reincarnate this allegorical figure into the Muse, or Scribe, of the Legislative Branch of government. The composition includes eagles perched atop Corinthian columns, representing the chambers of the Senate and the House of Representatives. 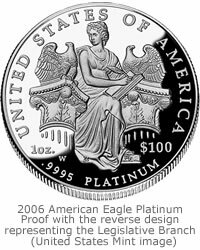 United States Mint Sculptor-Engraver Don Everhart executed the design. Designed by United States Mint Artistic Infusion Program Master Designer Thomas Cleveland and engraved by United States Mint Sculptor-Engraver Phebe Hemphill, the reverse design depicts a bald eagle with its wings spread wide to represent freedom with a shield at the ready to enforce the laws that guarantee those freedoms. Designed by United States Mint Artistic Infusion Program Master Designer Joel Iskowitz and engraved by United States Mint Sculptor-Engraver Charles L. Vickers, the design features Lady Justice, a classic symbol dating back to Greek and Roman times. In her right hand, the scales are suspended from one finger, representing the delicate balance of the law. In the other hand she holds the sword, signifying the power that is held by those making the decision. The bald eagle, our Nation’s symbol of power, courage and freedom, is featured watching over our firm foundation of democracy. The obverse or heads side features Lady Liberty, symbolizing vigilance and faithfulness to duty. It was designed and engraved by United States Mint Sculptor-Engraver John Mercanti. The coins bear the “W” mint mark indicated they were minted at the United States Mint facility located in West Point. Orders may also be placed via the Mint’s toll-free number, 1-800-USA-MINT (872-6468). Hearing and speech-impaired customers may order by calling 1-888-321-MINT (6468).